This post was sponsored on behalf of K’NEX. All opinions stated are my own. In all my years building things as a kid, I never dreamed that I would have a job one day that paid me to have fun. I grew up playing with every building toy you can imagine. It was always fun creating something new as I would do an all-nighter building marathon with friends in front of the TV. 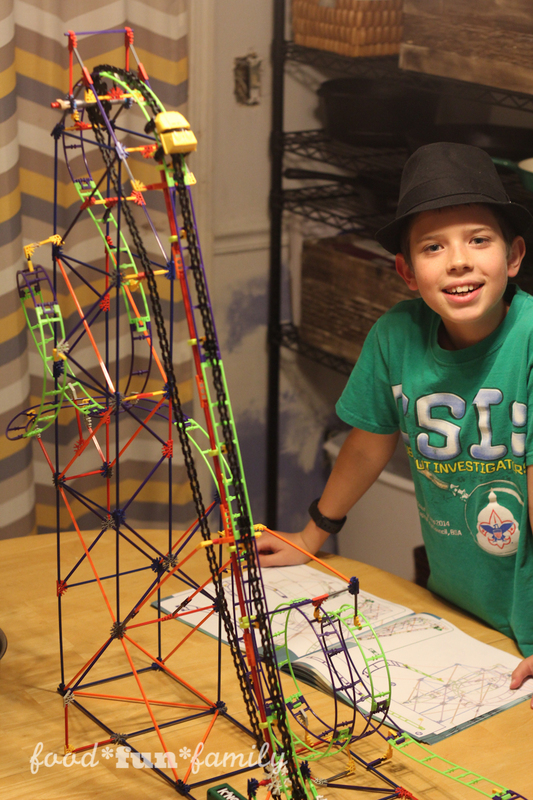 My son and I recently built the K’NEX Wild Whiplash Roller Coaster. K’NEX are really cool because you can build a working project that is quick and easy to assemble. We spent just a short part of our evening putting together the Wild Whiplash Roller Coaster. It was pretty straight forward and it worked flawlessly. My older son jumped in last minute to help us finish up the track and chain that lifts the roller coaster to the top of the ramp. He couldn’t resist joining us when he saw how much fun we were having putting it together. After a little while of using the pre-designed build, we modified the loops and made a new variation that had a totally new feel. Strangely, K’NEX are a lot lighter that other construction toys. They are so light, in fact, that you feel like they are going to fall over, but they are actually quite strong. Most things you build with have to be put on a solid foundation or structure to be usable, but this roller coaster was easy to move around without anything attached to it. We took it off the table in seconds without having to take it apart or worry about it falling apart. It’s the lightest construction toy I have ever used. Let me say one very specific thing that I liked more than anything. I have built lots of spaceships, buildings, cars, and other things. One of the things that can be irritating is trying to find the right piece. Usually there will be a legend or an instruction box, but inevitably, there is some piece that you can’t figure out. 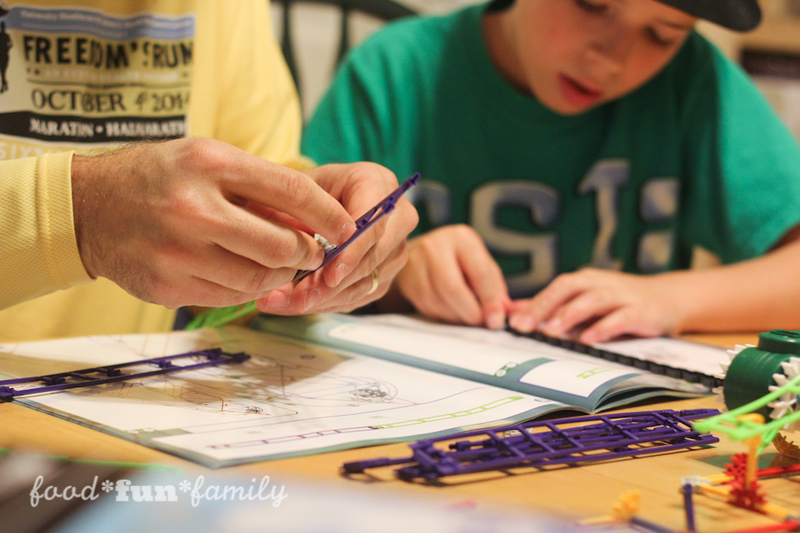 With K’NEX, each piece is color coded. If you need a piece that is a certain length, it only comes in one color, so you know exactly what you are looking for. 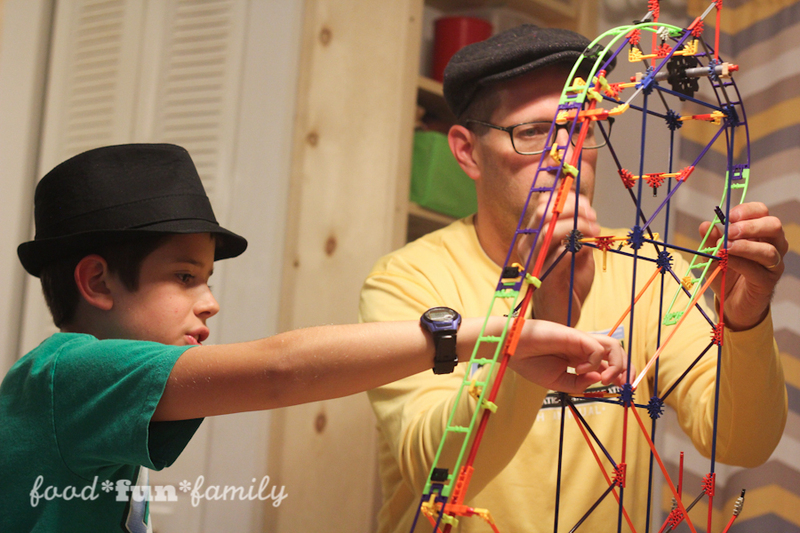 This simple design idea saved us so much time when we were assembling the roller coaster. 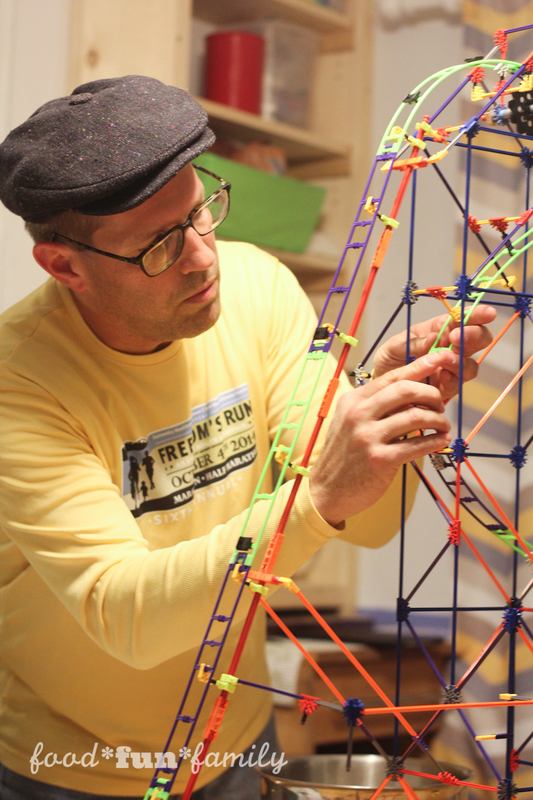 After we finished up the initial build, my son was looking for a piece that connects the large K’NEX pieces to the small K’NEX (he has two boxes of K’NEX). He told me to look for a neon green piece. I didn’t know what it looked like, but I found what he needed in seconds. It was quite awesome. 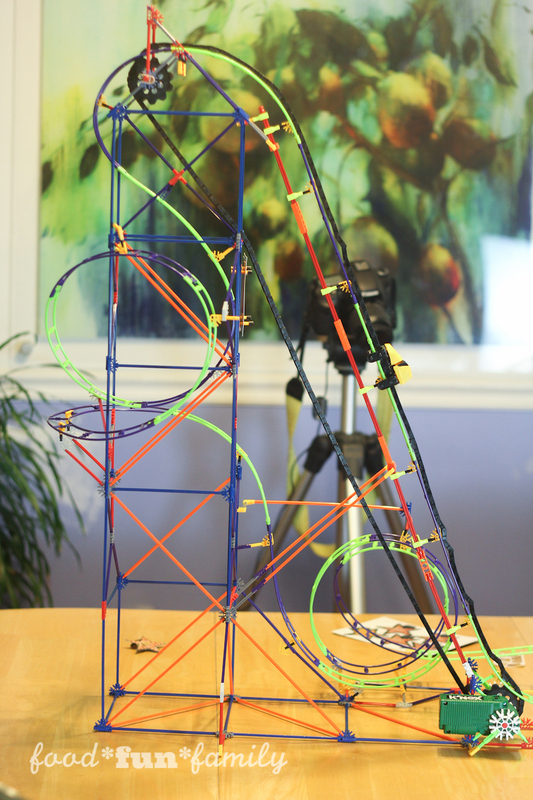 He used the extra pieces to extend the roller coaster and change some of the loops. So, my hat is off to K’NEX. Thanks for the roller coaster and bigger thanks for making something that is easy to build and worth the time. They really give you an opportunity to design things that will work. You can use the initial project as a springboard for other designs. I know that is typically what I do. You can watch me and A.J. build the whole thing in a two-minute timelapse here. Look out for the apple dumplings my wife made. Dale Franklin has written 11 post in this blog. CandyMan (also known as Dale or Dad around here) is Lolli's husband, Dad of five kids, and general jack of all trades at home.